About three years ago, I would run with music. It was great. I would run down the street, looking odd because I would be singing my favorite songs as I logged my miles. However,my old running headphones, which were great because they wrapped behind my head and weren't too snug in my ears, broke. My first run without music was hard, but it got easier. Then I started to look odd because instead of singing with noticeable headphones in my ear, I was talking to myself outloud while running. It was a bit of alone time, not completely quiet because I live in the suburbs and cars whizz by all the time, but yet a solitude with my thoughts not distracted by a top 40 hit. There were other reasons I refrained from buying new headphones and retrained myself to enjoy some media free miles. The biggest was safety. I could easily hear cars, people, bikes, dogs, you name it coming my way. I will admit in the past, I sometimes didn't hear that car coming from behind me to turn into the grocery store parking lot. Not smart at all. Also for safety, as a female runner running a majority of miles solo, being able to be 100% aware of my surroundings. Thirdly, I have sensitive and small ears therefore ear buds end up hurting after about 6 miles. 6 miles is sometimes pushing it. With my small ears, it is also hard to find earbuds that will stay in comfortably. Recently, I have been wanting to have music on my runs again, though. The biggest reason is that I have sort of fallen out of love with running; not completely. I still crave a good run pushing myself to run "fast", a great run with my boys so we can discuss what is new in their life, a run date with the hubby is always good. I had a really disappointing race at the beginning of the year, a race where I thought I might not finish, was hurting and saw my finish time grow by nearly an hour. After that race, the motivation diminished. Music seemed like the answer lately. I wanted to hear those top 40 hits or 90s hip hop groups to cheerfully make me forget the struggle I was having to get out and run. The answer: Jaybird BlueBuds X.
I've had my pair of BlueBuds X for about two weeks now. I was super excited to open the packaging. It basically opens like a book to the ear buds placed inside, surrounding a cute and tiny carrying case. Also inside are different wings tips and buds. The wing tips are used to keep the ear buds in place. There are two ways you can wear the BlueBuds - as traditional buds or around the ear. You choose the best size according to your ear opening to make the best connection to your ear. Right out of the gate, I chose the smallest buds. In the house they felt great, felt like they were as snug as could be. Once I set out on my run, the right earbud kept falling out. I spent 3+ miles trying to put the earbud back in. Back to the drawing board. I spent time at home "practicing" putting them in, obviously it was user error. But to no avail, they kept falling out; however on subsequent runs, both sides kept failed to stay in. I went a size up and the problem has lessened, but the left side continues to fall out. With each run, I get better at putting them in and I am confident that I will get the hang of wearing the BlueBuds X. * The sleek design is cool, they are stylish without being obnoxiously out there. 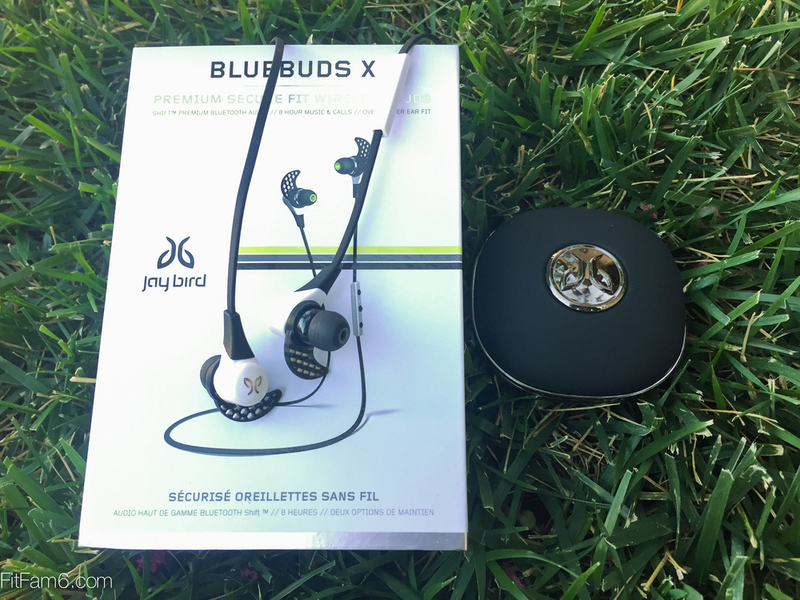 Overall, I enjoy the Jaybird Bluebuds X. They are slowly but surely becoming part of my running essentials. I have even wore them a few times when running with the husband. That's huge because I like our time together. It allows us to catch up without being interrupted by kids and I can give him a "Honey Do List". Haha. I am back to singing and honestly, sometimes subtly dancing to my music, more so at stoplights. I feel comfortable using them and am still aware of my surroundings. I have learned a thing or two from my three media free years that I believe have become habits. The buds have surely been bringing back my eagerness to get out and run. Recommend for sure!